Small enough to perch on your finger yet so intelligent they can learn large vocabularies and hosts of tricks, parakeets are ideal pets for the beginning bird enthusiast. Also known as budgies, the birds reach full maturity at about 8 months of age. Before that time, you can approximate the age of an immature parakeet a few ways. If your parakeet has stripes all over his head down to the base of the beak, he has not yet gone through his first molt and is definitely a juvenile. The first molt occurs at about 4 months of age, when a cap of pure white or yellow feathers replaces the stripes on the top of the head. If you purchase a parakeet who still has bars on his head, make sure he is more than 8 weeks old to ensure he's fully weaned. Baby parakeets have coal-black eyes that are a single color. As budgies age, the pupils remain black but the irises surrounding them fade to a light gray or brown by the time they are 8 months old. If your little budgie has completely black eyes, you can be certain he is less than 4 months old. If his eyes are dark grey with black pupils, you can approximate his age at between 4 and 8 months. Light grey irises indicates a fully mature bird. The cere is the strip at the base of the beak where your parakeet's nostrils are located. In juvenile birds, the cere is usually a grey or bluish color. After the bird reaches 1 year old, the cere in males deepens in color. Depending upon your parakeet's breed, the male's cere will take on vivid hues of violet, pink, purple or blue. Female ceres will be white, tan, brown or light blue. If your parakeet has a leg band with letters and numbers, you may be able to determine the year of his birth. 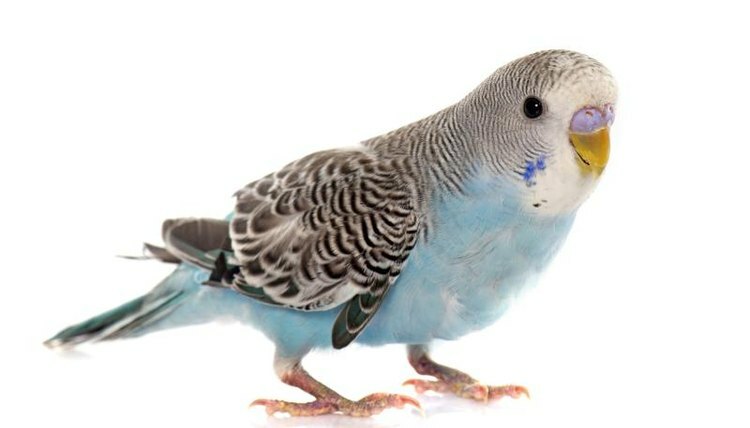 Although some breeders register their parakeets with different organizations, most budgies are registered with the American Budgerigar Society. The ABS band is easily recognizable by the initials on the band, followed by a breeder code and the year of the bird's birth. You can tell the year the bird was registered by the color of the band, too.